California has long been a leader in promoting wind and other renewables to power the electricity grid. Recently, California has gone even further and in 2011, Gov. Jerry Brown signed a law to force an increase in the amount of renewables utilities must use to 33 percent of the state’s electricity by 2020. Currently, the state is experiencing a stressed electricity grid because of high demand and because some nuclear and natural gas plants are offline. Mandated renewable energy is proving itself incapable of filling the void. This situation show how little actual value wind, solar and other politically correct renewables have in the real world work of supplying people with electricity when they need and want it. Because California is rushing headlong toward more and more renewables in the electricity grid it is important to look at how renewables are contributing to keeping the electricity grid stable. For example, California has 4.297 gigawatts of installed wind capacity which could really help California balance the grid if the wind blew at the right times (spoiler alert—the wind doesn’t blow at the right times). 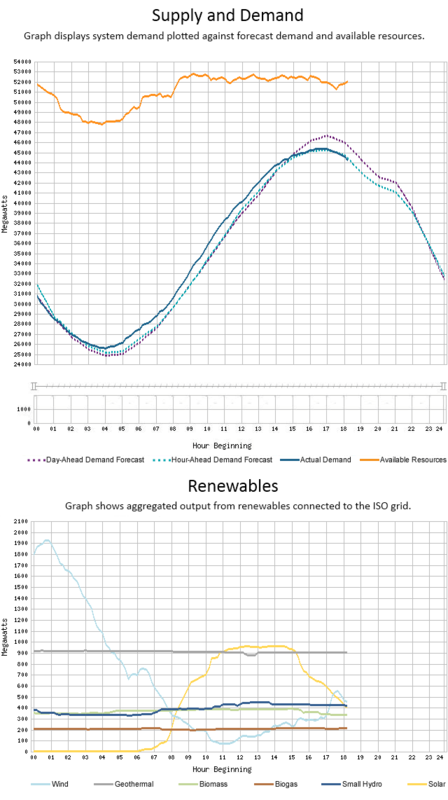 The first chart below shows the supply and demand for August 9, 2012 in the California ISO electrical grid. The actual demand is in blue and the available generation is in orange. The second chart shows the renewable generation in California at that time. There are some very important things to note with respect to the renewable generation. Wind’s production peaked just before 1 am, when electricity demand was dropping as people went to bed and nighttime temperatures reduced the need for air conditioning. At the time, wind was producing 6 percent of California’s electricity, but after 1 am, wind began to falter and wind production fell by 90 percent by 11 am. At that time, wind was producing less than 100 megawatts of electricity—a mere 0.2 percent of the electricity in California. This shows how wind fails to produce electricity when needed most. At 11 am, as electricity demand was rapidly increasing and electricity producing was needed most, wind was at a low ebb. Fortuitously, wind production increased in the afternoon, but by 5:30 pm, wind was only producing a little more than 1 percent of California’s total electricity. Solar helped meet demand more than wind, because solar has the advantage of producing electricity when the sun is shining and households are using more power. But even solar failed to produce much electricity during the period of highest demand, producing just 2 percent of the state’s electricity at its peak. Solar production peaked at nearly 1 gigawatt at 11 am and continued to produce about 1 gigawatt until 3 pm. The problem is that the state’s highest period of demand occurred at about 5 pm, when solar’s production had fallen by over 50 percent from its peak. This data shows how little value wind and solar have in producing electricity when people really need it, and should be a wake-up call to California—one of the many states with mandates—as well as the Obama administration and other promoters of wind and solar. Even though wind and solar production might be growing in California, it isn’t helping to balance the grid and keep the lights on. Electricity production has to balance electricity demand and wind and solar aren’t doing a good job contributing. Moreover, it does not matter how many wind and solar installations are built because natural gas and other reliable power plants will be required to be built to meet peak electricity demand. All of this begs a simple question, if wind and solar have so little value in supplying power when it is needed most, why is the Obama administration lavishing billions of taxpayer dollars, beneficial mandates, and special favors on these unreliable and expensive sources of electricity generation? The California situation shows that wind and solar can’t be reliable upon to keep the lights on, so why do they receive such large subsidies? The above data shows that the explanation isn’t likely related to the need to keep power affordable and reliable for the millions of U.S. households and businesses that use it.